Bus from Kuantan to KL is the most important bus service in Kuantan Sentral as it connect people to Malaysia capital Kuala Lumpur. There are number of players serving bus from Kuantan to KL. LA Holidays, Etika and Mayang Sari are three reputable bus operator providing quality service and frequent schedule from Kuantan to KL. Transnasional and Plusliner are the other two reliable operator managed under government. Many locals are used to take these government bus since their childhood times. LA Holidays is the only operator offering USB charging point and Wifi service on board. LA Holidays would be the choice for passengers especially business travellers who require power supply access during the journey. Other bus operators with quality service are Kesatuan Express, Konsortium, Mata Air and Mega Jaya Express. They provide less frequent 1 -2 daily services from Kuantan to KL. Taking bus from Kuantan to KL are always comfortable, cheaper fare, and convenient as compared to flight. Budget bus fare is at around RM 24.00 against much expensive flight ticket. The journey from Kuantan to KL takes about 3 to 3.5 hours depending on traffic condition. Washroom break will be provided upon request to driver during the journey. All coaches serving this route Kuantan to KL are VIP bus with more spacious seating layout. Passengers could relax themselves during the journey with the spacious and inclined seat. Kuantan Sentral located at Indera Mahkota is the boarding point for bus to Kuala Lumpur. The arrival point in Kuala Lumpur is at the modern bus terminal TBS (Terminal Bersepadu Selatan). Passengers who are going to city centre could take the LRT service next to TBS. 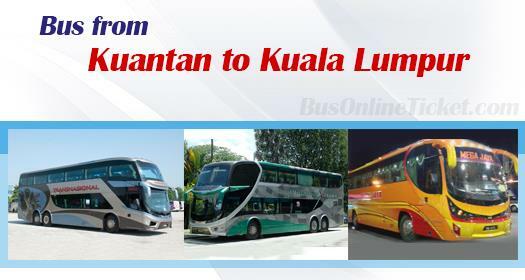 One can book online for bus ticket from KL to Kuantan in BusOnlineTicket.com, a reputable website which launched the online booking service since 2007. Besides that, travellers also save the time and save the cost to purchase ticket at counter.